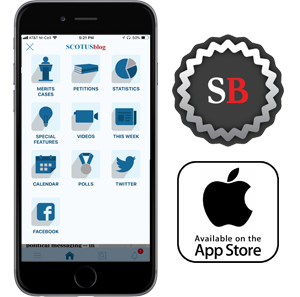 You can now download the final SCOTUSblog Stat Pack for October Term 2017 here. This year, the 45-page Stat Pack includes information about, among other things, the rate of unanimity, the opinions written by Justice Anthony Kennedy in his last term, agreement among different justices, the distribution of majority opinions by senior justice, which justices asked the most questions at oral argument, and the advocates who argued the most frequently during the term. Below you can view each section of the Stat Pack individually and review our key takeaways from the Stat Pack. We would like to thank all of the individuals who provided comments and feedback on the Stat Pack throughout the term. Our Stat Pack is compiled as a labor of love, and once again the SCOTUSblog community has been hugely influential in shaping the content and design of our statistics. If you have any comments, suggestions or corrections, please do not hesitate to send me an email. Unanimity: OT17 saw an uncommonly low level of unanimity. Only 39 percent of merits cases were decided 9-0, the lowest rate since OT08 (30%). See Stat Pack, page 15, 15-16. 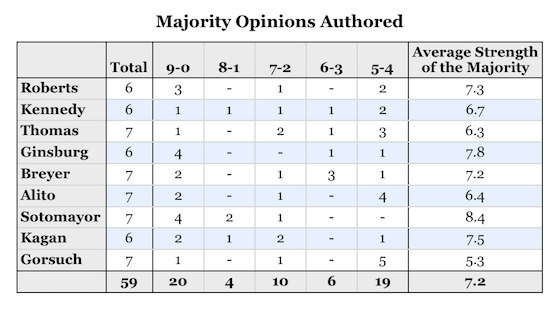 Majority opinion authorship: Some justices are more likely to write opinions in divided cases than others. In many years, senior justices write more divided cases than their junior colleagues because they can assign close cases to themselves. Remarkably, by at least one measure, Justice Neil Gorsuch wrote more frequently in divided cases than any other justice during OT17. Five of the seven majority opinions he wrote during OT17 came in 5-4 cases, which also constituted five out of the 19 total 5-4 cases from the term. 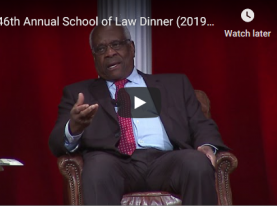 By comparison, four out of the seven majority opinions authored by Justice Sonia Sotomayor came in 9-0 cases, and she did not write the majority opinion in any 5-4 or 6-3 cases. See Stat Pack, page 13. Frequency in the majority: Chief Justice John Roberts was the justice most likely to be in the majority this year, appearing there in 68 out of 73 cases (93.2%). Justice Anthony Kennedy, who voted with the majority in 67 out of 73 cases, was a close second (91.8%). Only twice during the Roberts court era have Roberts and Kennedy not been the top two justices in our “frequency in the majority” metric. See Stat Pack, page 17. 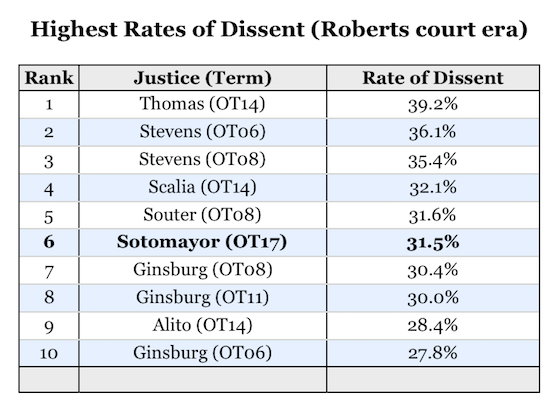 Justice agreement: The two justices with the highest agreement rate during OT17 were Justices Ruth Bader Ginsburg and Sotomayor (95.8%), followed by the pairs of Justices Clarence Thomas and Samuel Alito (93.0%) and Justices Stephen Breyer and Elena Kagan (92.6%). The pair with the lowest rate of agreement was Alito and Sotomayor (49.3%). Alito and Sotomayor are the first justices since OT08 to finish the term with an agreement rate below 50 percent, meaning they are more likely to disagree than agree on the outcome of a case. In OT08, Justice John Paul Stevens had an agreement rate below 50 percent with Justices Antonin Scalia, Thomas and Alito. See Stat Pack, page 26. 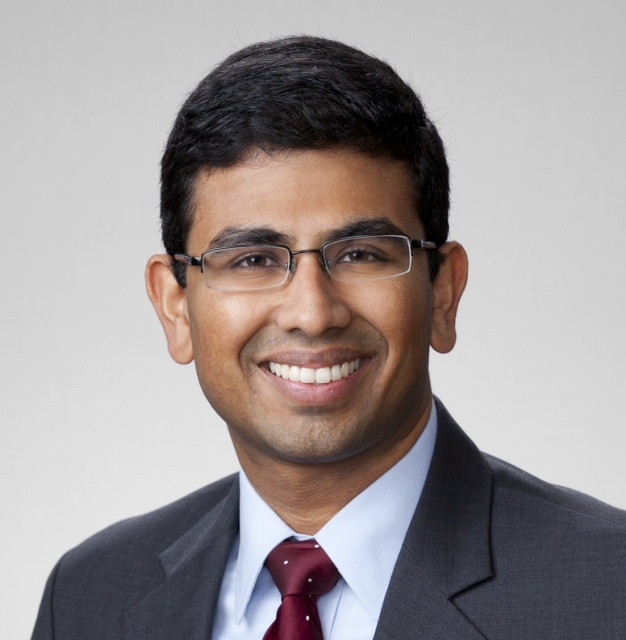 Oral argument – Advocates: Due in part to turnover in the Office of the Solicitor General and the proliferation of state solicitors general, the average “age” of the advocates who appeared during OT17 dropped from the previous year. The average law school graduation year for an advocate during OT17 was 1997, up from the OT16 average of 1994. Twenty-two advocates argued during OT17 within their first 10 years of graduating law school, again up from 14 in OT16. While the most recent law school graduates who argued during OT16 completed law school in 2007, this term there was one attorney from the class of 2013, two from the class of 2012, one from the class of 2011, and four from the class of 2010. This term also saw the fewest oral argument appearances by women since we began tracking that statistic in OT10, 19 (12%). See Stat Pack, page 33.